Each year on the first Sunday after Labor Day we have an official day to celebrate our grandparents. Although we should celebrate our grandparents more often than once a year, it is fun to have an official day to celebrate how great your grandparents are. 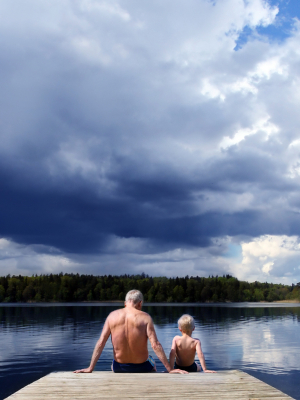 Here are a few suggestions to help you have a wonderful Grandparents Day this year. Grandparents love receiving handmade items from their grandchildren. This year make your grandparents a special card yourself. The simplest way to make a card is to fold your piece of paper in half the short way. You can also fold the paper in half the long way, then fold that in half again to make a smaller sized card. Once your paper is folded you can color anything you would like on the card. You can also get more fancy with your card by making a pop-up card or many other craft options. Finish your card by writing a special message to your grandparents and make sure to give it to them on Grandparent's Day. With your grandparents make hanging photo frames. This will allow you to create memories with your grandparents while also giving them a gift to remember you by. When you visit your grandparents bring a few photos you have selected of you with your grandparents or other photos of you and your family, which you will put in the frames. Start by cutting out frames for your photos. You can cut out a regular rectangle frame or you can be very creative and cut out different shapes. Next place the photo on the frame and secure with glue or photo corners. The photo corners will protect the photo better, but are not as simple to use as regular glue. Decorate your frames around the photos if you choose. Next, turn the frames with photos over, so the back is facing up. Spread them evenly spaced in a line. Cut a piece of string or yarn that is long enough to connect all three frames and have extra at the top to create a loop for hanging. Glue the yarn to the back of the each frame, connecting them together, creating hanging photo frames. At the top tie a bow or a loop, so the frames can be hung up. Allow all the glue to dry then find a fun place to hang up. The essential aspect of celebrating Grandparents Day is to spend time with your grandparent, so make sure to visit them and have a fun day. You don't have to do crafts, you can also play board games, or do some other activity that your grandparent enjoys. Grandparents have a lot of interesting things that you can learn from them and they are filled with fantastic stories, so no matter what you decide to do you are sure to have fun.